Sky Tour position cursor on TheSkyX sky chart. Versions of Sky Tour from 1.86 onward can interface with TheSky astronomy program from Software Bisque, Inc. 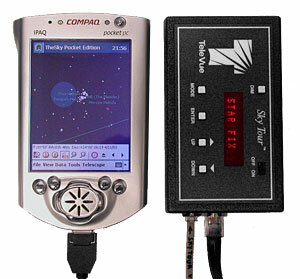 Connecting your TheSky equipped Pocket PC, Windows, or Macintosh computer, to Sky Tour yields instant access the TheSky's copious object database. Locating and identifying celestial objects is easy, as your screen displays a sky chart indicating exactly where your telescope is pointing at all times. TheSky's real-time centering display easily guides you to the target. Mobile device running TheSky Pocket Edition interfaces with Sky Tour. Centering a target on the small screen of a mobile device is no problem with TheSky Pocket Edition.